"Hawks can fly very high and rabbits can run very fast". Each animal has its special merits in the competition of survival. As a matter of fact, this is no exception for plants too. The national flower of Zambia – bougainvillea, is one of such examples. The flowers of bougainvillea are small and they have no fragrances either; so it is very difficult for them to attract bees and butterflies to do pollination for them. However, in order to produce offspring, the flower has its own tricks. It enlarges the buds next to the petals and dyes them into red, yellow, white, orange or red and white colors, which look quite like beautiful flower pedals. In this way, the flower becomes a place frequently visited by bees and butterflies and its problem of reproduction is settled. The stalks of bougainvillea look quite peculiar. They may twist towards the right or left, they may bend towards one or more directions, or they may wind together and entangle into ties; the twigs and vines of bougainvilleas are long and thorned; the vines are highly flexible and plastic; they have strong bourgeoning vitality and are endurable for cutting. Local people often weave them into flower supports, flower pillars, green corridors, arches, and decorations for the wall surfaces; or cut them into all shapes for people to view and admire. Aged stalks can be used to make potted plants; they have hearty vitality and can be reproduced through inserting the twigs into the earth; thus they can also be grafted artificially. "Works of the Nature are not as artful as artificial works". 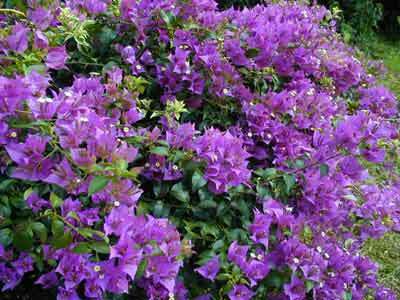 If many varieties of bougainvilleas are engrafted into one plant, the people would see the phenomenon of various flowers growing on one plant, which is extremely pleasant to the eyes.